The ability to play online is very convenient for poker players, as it allows you to quickly load up a table and start playing for real money almost instantly. Not only is the convenience factor a great plus point for online poker, but also the fact that you can play at multiple tables at once has it own profitable advantages. Whereas in live poker games you are confined to playing at one table at a time, online poker allows you to open up a number of windows and play at different tables simultaneously. For those players that are new to online poker, or have yet to try out playing at multiple tables, it may seem like a technique that only the pros would use. However, multi-tabling is very popular amongst many players that are simply looking to help increase their win rate per hour. Some games will of course be easier to multi-table with than others. For example, Texas Holdem is a game that is frequently multi-tabled by players, due to the fact that there are a limited number of betting rounds, and a lot of the information needed to make solid reads can easily be picked up throughout the game. However, other games like 7-card Stud will be far more difficult to multi-table, as more attention is required to make the most profitable plays on each street. More Tables = Higher Win Rate Per Hour: It’s gotta make sense! As I have mentioned, the main reason for someone to play at multiple tables is to increase the amount of money you win each hour. If you are a regular winner at the 25c/50c tables earning 8 big blinds an hour, simple logic suggests that if you increase the amount of tables you are playing at one time, you should in turn increase the amount of money you are winning in a given time period. One point that you have to factor in to multi-tabling however is that when you are playing a number of different hands simultaneously, your focus will be divided and split between each of the tables you have open. This will therefore have an adverse effect on your ability to make reads, and so the quality of your decisions will decrease with the more tables you open up. However, this is not necessarily as detrimental to your game as you might think, as multi-tabling may still help you to increase your earnings. For example, lets say you regularly win 10BBs per hour at your desired limit. If you play at two tables at the same time and find that your win rate at each table has been reduced to 7BBs per hour, your overall win rate per hour has improved to 14BB’s per hour, which is collectively higher than the amount of money you would be winning by playing at one table at a time. On the other hand, you can go too far across the other end of the scale if you are opening up more tables than you can handle. If you decide to open up 6 tables at once and find that your win rate per table is reduced to 1BB, your overall win rate will only be 6BBs per hour, which is 4 less than if you had stuck to playing at one table. Furthermore, if you play at too great a number of tables, you may well find that you will be losing more money than you win. The key to multi tabling is to find the ’sweet spot’, where the amount of tables you are playing at maximizes your overall win rate. For the majority of people, the optimum number of tables to play at is between 2 and 4. Some players are more comfortable with much more than this, but in general 2 to 4 tables is about right for players that are looking to increase their winnings from just playing at one table alone. In general, the best strategy when multi-tabling is to stick to simple ABC poker, where you bet your strong hands and fold your weak hands. Because your attention is going to be divided amongst a number of tables, it means that you will not be able to pick up on as many reads as you would normally be able to, and your standard of play will be affected. Consequently, if you try and make extravagant manoeuvres to outplay your opponents, you will often land yourself in an unprofitable position. So stick to basic poker strategy and you should do just fine. 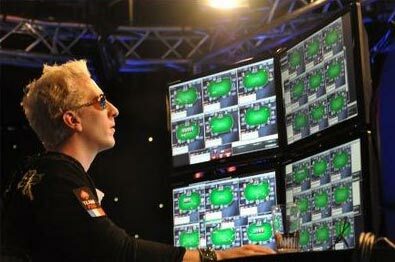 Multi-tabling is one of the greatest advantages of playing poker online. In addition to increasing the amount of money you can win, multi-tabling can also help to reduce boredom in between playing hands. For some, playing at one table becomes incredibly tedious, and so they find themselves playing more hands than is profitable just to overcome the boredom. This means that multi-tabling can be a great option for those looking for action, or those that find it difficult to just focus on one game at a time. At the end of the day, for whatever your reasons, multi-tabling is something that all players should try out at one time or another. It may not be suited to some, but it is a great way to liven up your online poker experience and potentially increase the amount of money you are winning from the game on a daily basis.